The Marie Raos Ray White Howick Pakuranga Premier Men went into the final day of the two day competition in an almost impregnable position. At stumps on day one the Alpacas had been dismissed for a formidable 383, a total which was always going to be too much for relegation threatened East Coast Bays on the second day. This total had been based around a magnificent century by skipper Bill Walsh who occupied the crease for more than five hours for his 126. Batting conditions had been very difficult until mid afternoon when things had dried out. Dale Phillips 47 and David Winn 45, both formed good partnerships with their captain and Danru Ferns, who hit seven sixes in his 94 took advantage of the tiring bowlers and put the icing on the cake. Day two did not start well for East Coast Bays who had to bat in very similar bowler friendly conditions to the previous week. Donovan Grobbelaar used all his experience to take advantage of the conditions and took the first two wickets with only nine runs on the board. He took another with the score was 46 and it looked as if the local lads were cruising to victory. However Ryan Harrison 52 and Seb Langridge 50* settled in and as conditions improved looked very comfortable out in the middle. The tone of the match changed when the players discovered that chief rivals Suburbs New Lynn had been beaten by Cornwall just before lunch and the sting went right out of the match. The Alpacas knew they were the champions and East Coast Bays also knew that their side was moving down into the Premier Two division next season. Langridge and Harrison batted through for another hour and the two captains shook hands and settled for the draw with the East Coast Bays score at 135/4. 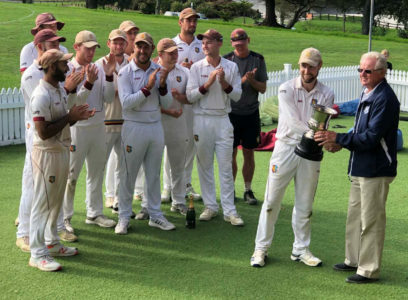 Howick Pakuranga have had a great year right through the grades with the Premier Men winning the Hedley Howarth Two Day trophy and the T20 Championship as well as progressing to the semi-final of the Jeff Crowe One Day Championship. The side had a core of quality players with the best squad of bowlers in the competition and great depth in the batting line up. Bill Walsh, Andrew Morrison, Brian Barnard and Daniel Young all averaged over 40 in the Hedley Howarth Trophy with Young’s 509 being the highest aggregate in that competition. Danru Ferns and Rudi Botadra both finished in the top 10 bowlers list with the others all contributing well. Andrew Morrison was top wicket keeper with 19 dismissals. The key to winning the two day grade is to secure the first innings points and for the second year running the team did that. Last but not least the contribution of coach Alan Hunt to the performance of the three top sides was highly significant and it showed in the improved results by the seconds and thirds. The club was very fortunate to have the players guided by a man who played at least 10 seasons for Auckland and had coached successfully at Provincial level with Central Districts.